Hummingbird cupcakes with brown sugar cream cheese frosting. By now, you were probably hoping that I would have some things to say about our new home state of Kansas. The truth is, I really don’t. Some days, I absolutely love it (the weather is pretty similar to northern California this time of year), but other days I struggle with the fact that everything is new. I can’t go into a store and find my way around. My first day of work, they closed the freeway near our house, which put me in panic mode because who bothers to learn more than one way to get to work in a new town? I came home and made myself cupcakes, because I feel like I deserve it after traffic stress! Hummingbird cake is one of Southern Living’s most popular recipes. It is a soft white cake full of banana, pineapple, coconut and pecans. These ingredients were considered special during our grandparent’s time and were saved for the holiday season. Since ingredients are available all year these days, you can make this cake any time of year. That’s a very good thing, trust me. The traditional frosting is cream cheese, but I opted for a brown sugar cream cheese here. I love the molasses flavor paired with pecans. If you’re more of a traditionalist, use the cream cheese frosting recipe from my Red Velvet cupcakes. I want to say thank you so much for the sweet, wonderful, kind and touching comments on my last post. I was worried that I was sharing a bit too much of my personal business, but your kindness proved me wrong. Thanks for reading and thanks for everything sweet you said. I took it to heart and won’t forget it. I offer you these hummingbird cupcakes as a thank you. Hummingbird cupcakes with pineapple, coconut and pecans, with a brown sugar cream cheese frosting. Preheat the oven to 350, and line a muffin pan with 4 cups. In a medium bowl, stir together the canola oil, banana and sugar. Mash the banana into the oil and sugar mixture. Once it's well incorporated, stir in the pineapple, coconut, egg and almond extract. Mix well. Sprinkle the flour, baking powder, cinnamon and salt on top. Stir until combined, but don't overmix. Divide the batter between the 4 cups and bake 18-21 minutes, or until a toothpick inserted comes out clean. Let cool completely before frosting. To make the frosting, beat together the cream cheese, butter and brown sugar. Begin by adding 3 tablespoons of the powdered sugar and beating it together well. If the frosting is too stiff, add the remaining powdered sugar. Frost the cupcakes and serve. So pretty! I love the look of these! Dear Lord, I want one of these so badly. Never fear, dear, you’ll figure out your town and before long, it will all make sense. Although, I never did figure out Fayetteville, NC, but that’s because the street name would change in the middle of the road. It was nuts. I loved your last post. You will be beautiful and congratulations! I’ve only ever really lived in one city so I can’t imagine what it’s like moving to whole different state. I’m sure you’ll come to feel at home there soon though. Until then, cupcakes! I have always wanted to make hummingbird cupcakes! I need to get on it! If you haven’t yet, invest in a GPS for each car. They’re pretty cheap these days, and you’ll never have that “OMG I’m LOST!” feeling again. Anxiety over that is one of the things that had me hating NJ at first. It really dropped after we got a GPS. But I agree with you, Hummingbird Cupcakes are a sure fire way to ease anxiety too. Love, love these! And hopefully you found your way to work OK! Yes, we love learning more about the lovely gal behind the cupcakes. You are wonderful!! Ohh, hummingbird cake. So good. I think I’ll make these to take on an upcoming road trip. Thanks for the recipe. These look so delicate and gorgeous! Cupcakes make everything better! Especially ones as pretty as these :) Hope you continue to adjust to your new home! always love getting personal with the authors behind beautiful recipes and blog :) glad you shared! these look awesome! i like how you took the regular hummingbird cakes and made them into cupcakes! brilliant. !!!!! I HAVE ALL OF THESE INGREDIENTS IN MY KITCHEN RIGHT THIS MINUTE! i want to faceplant into a pile of these. how does one forget about hummgingbird cakes?! they’re delicious! I got lost going home my second day we lived in Long Beach. I pulled over and started crying. Ha. Brown Sugar cream cheese frosting? Be still my beating heart. Oh I love hummingbird cupcakes. They are my favorite. I’m sorry things feel so new in Kansas. It takes time to call any place home. It always takes time to adjust to new surroundings and people and I’m sure you will find your way soon and be more comfortable in your new home. Too bad that we all could not have a month off work when we moved and be able to take the time just to explore. Glad that you were in the baking mood though…these cupcakes look wonderful. Regarding your last post: I LOVE hearing about your business ;) I love your recipes, but I also enjoy reading about what you’re up to…the woman behind the blog – keep it comin! Regarding this post: yum on the humingbird cupcakes…yum all over them! 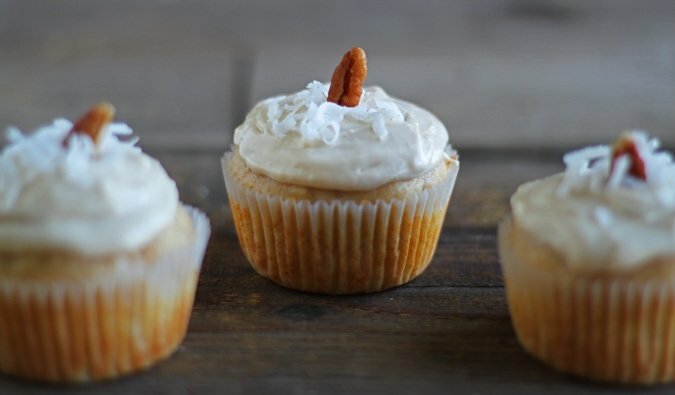 I hadn’t heard of Hummingbird cake/cupcakes until now, but I do think I have eaten something like that … I have only ever lived in/driven in one city, so I can’t even imagine how hard that must be to move somewhere new and learn to find your way around and feel “at home” there. I love white cake, but I have never heard of Humming bird cake before. I will have to try this recipe soon!! These are the prettiest cupcakes! I’ve never heard of Hummingbird cakes being from Philly, but I really like the idea! In no time it will feel like home :) Time makes most things better :) and cake! ha ha u and I solve our problems the same way – comfort food! ha ha! I love also adore you did a cupcake version, a cupcake version of anything is always sweeter! please make italian cream cupcakes!!? I made these tonight. I cannot get over how delicious they are! I especially like the frosting combined with the toasted pecans. I only had chopped pecans, so I toasted a bunch of them and covered the tops with the pecans. I am so happy to see these! My grandmother always made hummingbird cake for her Sunday school socials (sounds soooo southern, doesn’t it?? ), and it always reminds me of her. She died 12 years ago this week, so she’s been on my mind, and when I found this I knew I had to make them! I was looking for some small-batch recipes to make with my 2.5-year-old son, who’s currently obsessed with cupcakes (who wouldn’t be?!). Thanks! Aw, Meghan. Thanks for writing in. I think baking hummingbird cake is a great way to remember your grandmother. I bake lemon bars to commemorate mine :) Happy Baking! I love hummingbird cake! My grandmother always used to make it, too. But her recipe makes a layer cake or a million cupcakes, so I don’t bake it very often. I’ll have to try this version soon! Just now found this recipe on your site. Been wanting to make Hummingbird Cupcakes since last spring! So excited when I came across this and can’t wait to try it! 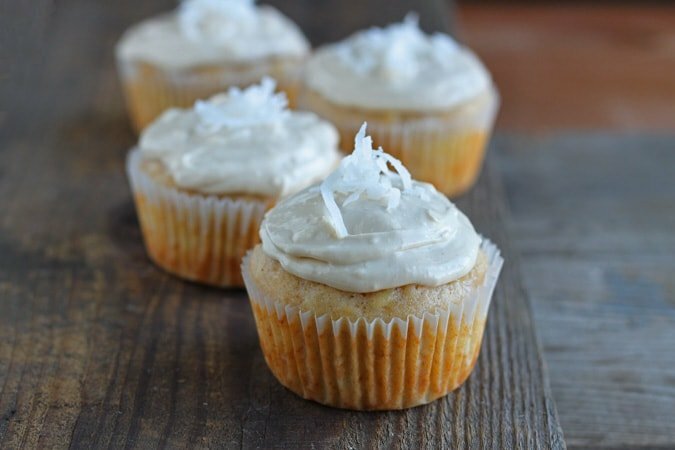 I tried these cupcakes they were delicious, frosting tasted gr8 thanks for the recipe. Is there anything I could possibly substitute for the pineapple in the recipe? Like canned mandarins? Or omit it? What are the options? I didn’t test the recipe any other way than how it is written here. Sorry. I cannot guarantee substitutions will work for you. Best of luck. 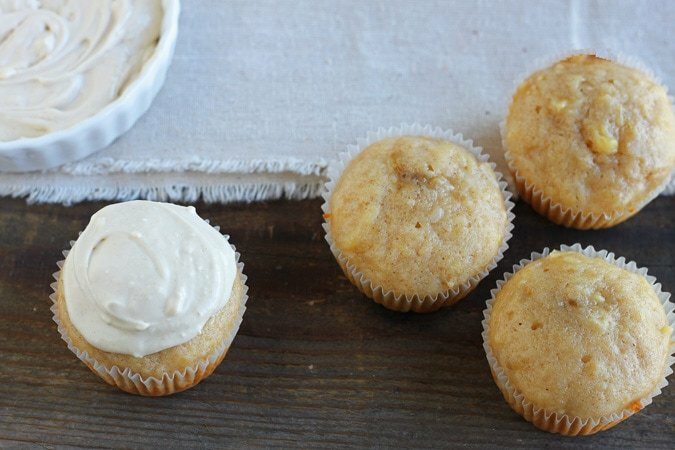 When baking 2 or 4 cupcakes, which holes work best? And do you leave the unused ones empty? I use the 4 cupcakes on the edge of the pan. They seem to rise higher. I explain this in my first cookbook, but I never have on the site before-sorry! And yes, I leave the rest empty. Hi there! I was thinking of tripling this recipe so it yield 12 cupcakes instead. Any tips on how I should adjust the ingredients/baking time?